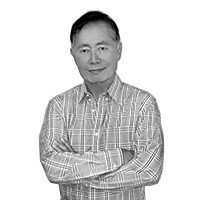 With an acting career spanning five decades, George Takei is known around the world for his founding role in the acclaimed television series Star Trek, in which he played Hikaru Sulu, helmsman of the Starship Enterprise. Takei starred in three seasons of Star Trek and later reprised his iconic role in six movies. Mashable.com says Takei is the #1 most-influential person on Facebook, with more than 4 million friends. Takei has more than 650,000 followers on Twitter. Debuting at #10 on the New York Times E-book nonfiction list, Takei’s fast-track journey to social media super-stardom is told in his new book, “Oh Myyy! There Goes the Internet,” available at Amazon.com in e-book and paperback. Among current projects, Takei and actor/singer Lea Salonga co-star in a new musical called "Allegiance.” The musical is an epic story of love, family and heroism during the Japanese American internment of World War II. A Broadway run is planned for “Allegiance” which world premiered at San Diego’s Old Globe Theatre in 2012. Recognized worldwide as a member of the original Star Trek cast, Takei has a star on Hollywood Boulevard's Walk of Fame and his signature and hand print are in cement in the forecourt of the landmark Grauman's Chinese Theater in Hollywood.